End Systems: These systems deliver NPDUs to other systems and receive Network Protocol Data Unit (NPDU)s from other systems, but do not relay NPDUs. This International Standard does not specify any additional End system functions beyond those supplied by ISO 8473 and ISO 9542. Level 1 Intermediate Systems: These systems deliver and receive NPDUs from other systems, and relay NPDUs from other source systems to other destination systems. They route directly to systems within their own area, and route towards a level 2 Intermediate system when the destination system is in a different area. Level 2 Intermediate Systems: These systems act as Level 1 Intermediate systems in addition to acting as a system in the subdomain consisting of level 2 ISs. Systems in the level 2 subdomain route towards a destination area, or another routing domain. A single organization may wish to divide its Administrative Domain into a number of separate Routing Domains. Routing domain is divided into "areas" same with OSPF. But there is no Backbone and Non-Backbone area router in ISIS, We call it Level 1 and Level 2. Level 1 routers know the topology in their area including End system (in OSPF we call it Host). Level-1 routers do not know the router destination outside their area. They forward all traffic to Level-2 routers to reach that destination. 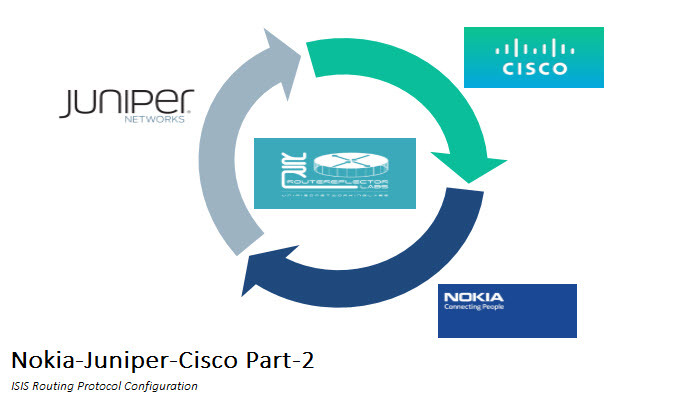 Only Level-2 router can exchange routing information with external routers or we call it external realm. 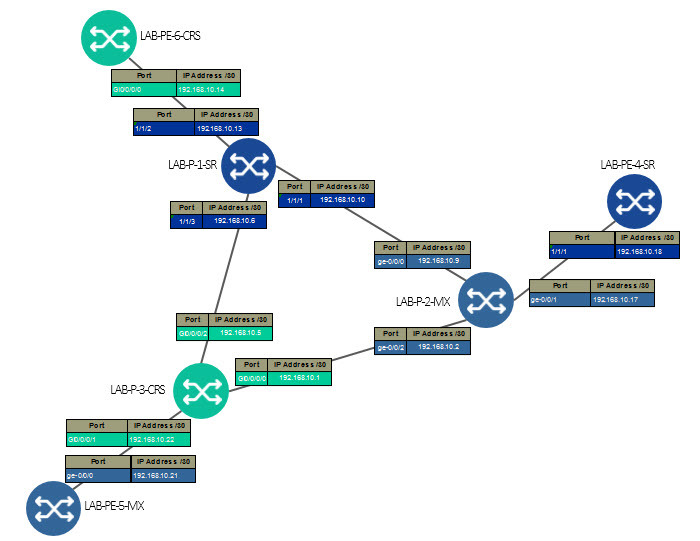 And Level-2 routers never know the topology in level-1 area. Link State PDUs are generated as a result of topological changes, and also periodically. They may also be generated indirectly as a result of System Management actions (such as changing one of the routing metrics for a circuit). 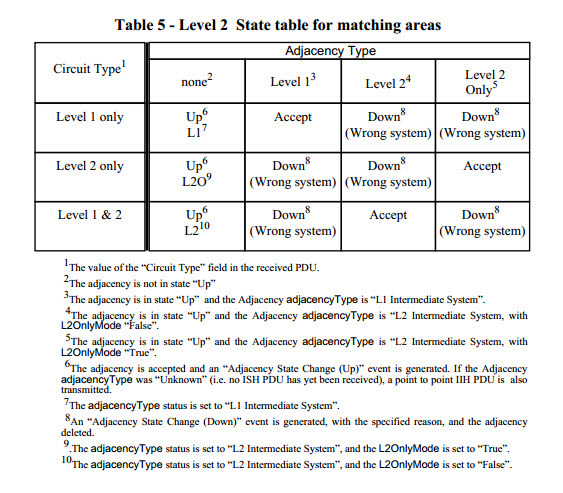 Level 1 Link State PDUs are propagated to all Intermediate systems within an area, but are not propagated out of an area. 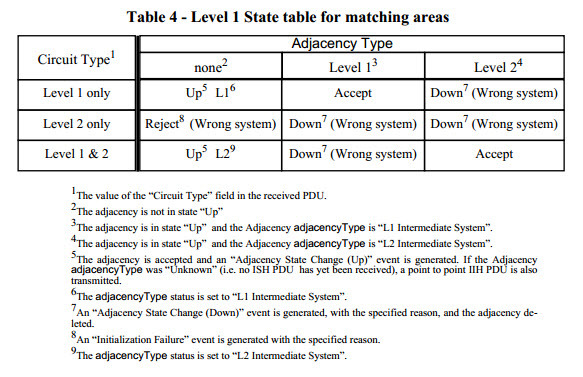 Level 2 Link State PDUs are propagated to all Level 2 Intermediate systems in the domain. Link State PDUs are not propagated outside of a domain. The update process, through a set of System Management parameters, enforces an upper bound on the amount of routing traffic overhead it generates. IS-IS support 2 network type they are point-to-point network and broadcast network. When implement broadcast network the Designator Intermediate system is preferred. Unlike OSPF DIS DIS election is pre-emptive, and no backup DIS in IS-IS. On a broadcast interface, L1 updates use 0180:C200:0014. On a broadcast interface, L2 updates use 0180:C200:0015. When neighbor was establish and all routing information completed received, the next process is decide the route destination based on SPF best path computation. In IS-IS the default metric is not depend bandwidth but automatically set metric to 10. IDP : Initial Domain Part, the part which is standardized by ISO, and specifies the format and authority responsible for assigning the rest of the address. IDI : Initial Domain Identifier, it’s refer to identify the authority that assigned the domain identifier. Each country's organization has an AFI and IDI. HO-DSP : High Order-Domain Specific Part, this part refer to sub domain. This part can allow assign sub address authority for domain routing. 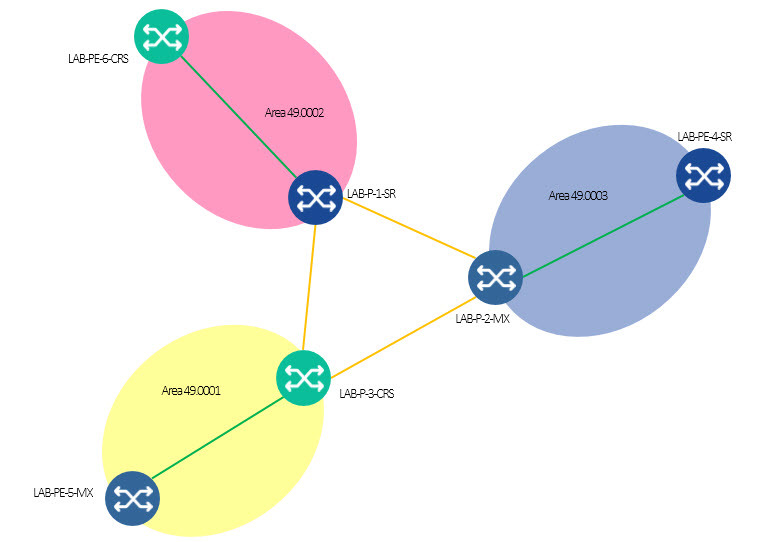 For Inter domain routing, it’s related to area. Example : in IS-IS domain they are area 1, 2, and 3. Where the AFI is 49 and IDI is 0, so the NSAP address is 49.0001.XXXX.00, 49.0002.XXXX.00, 49.0003.XXXX.00 where the XXXX is IS-IS system id for intermediate system (i.e. router). AFI and IDP related to Single autonomous authority, for this part when using private AFI address you may fill blank 0 for IDP or defined based on administrator configuration. Note: The N selector is generally ignored when working with routing protocols because it denotes a service on an end system, and routing protocols are concerned with routing to end systems, not the services on them. Add "0" to each subnet so it contains has 3 digit number, if the subnet has been contain 3 digit, you don't need to. Below the topology that tested in LAB. There are 6 routers. 3 routers as L1 and L2 router and 3 router as L1 router. 64 bytes from 192.168.20.3: icmp_seq=1 ttl=255 time=5.48ms. 64 bytes from 192.168.20.3: icmp_seq=2 ttl=255 time=5.75ms. 64 bytes from 192.168.20.3: icmp_seq=3 ttl=255 time=46.6ms. 64 bytes from 192.168.20.3: icmp_seq=4 ttl=255 time=48.8ms. 64 bytes from 192.168.20.3: icmp_seq=5 ttl=255 time=48.8ms. 64 bytes from 192.168.20.5: icmp_seq=1 ttl=63 time=9.96ms. 64 bytes from 192.168.20.5: icmp_seq=2 ttl=63 time=10.4ms. 64 bytes from 192.168.20.5: icmp_seq=3 ttl=63 time=10.7ms. 64 bytes from 192.168.20.5: icmp_seq=4 ttl=63 time=24.9ms. 64 bytes from 192.168.20.5: icmp_seq=5 ttl=63 time=9.11ms. 64 bytes from 192.168.20.3: icmp_seq=1 ttl=254 time=52.3ms. 64 bytes from 192.168.20.3: icmp_seq=2 ttl=254 time=195ms. 64 bytes from 192.168.20.3: icmp_seq=3 ttl=254 time=53.4ms. 64 bytes from 192.168.20.3: icmp_seq=4 ttl=254 time=451ms. 64 bytes from 192.168.20.3: icmp_seq=5 ttl=254 time=9.31ms. 64 bytes from 192.168.20.5: icmp_seq=1 ttl=62 time=85.1ms. 64 bytes from 192.168.20.5: icmp_seq=2 ttl=62 time=13.9ms. 64 bytes from 192.168.20.5: icmp_seq=3 ttl=62 time=14.6ms. 64 bytes from 192.168.20.5: icmp_seq=4 ttl=62 time=14.9ms. 64 bytes from 192.168.20.5: icmp_seq=5 ttl=62 time=13.8ms.